If you learn of a specific opportunity to help any of your current clients or anyone else in your professional network – and you do not want to do the work yourself or are not the right fit for the need – please consider referring the opportunity to Patina. If we win the work – Patina will pay you a generous commission on the deal based on the billings it generates. 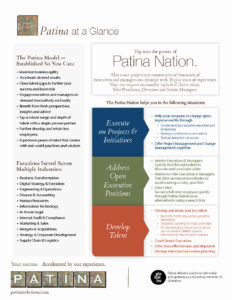 This is a great way for you to earn money and you can count on Patina to do a high quality job for your contact. You can submit your opportunity referral – and Patina will reach out to talk with you about the best way to proceed. It may be having you make the introduction – and we take it from there. Or you may decide to work along side us to help win the deal. There is no limit on the amount of commission you can earn. Rates are eligible for 2018 and 2019. Linda Jones is a CFO for hire. She has a manufacturing client where she serves as CFO for 40 hours a month. They need to hire a new VP Manufacturing – so Linda calls Patina and we are able to do the search. The search fee for Patina’s services is $50,000 and Linda earns 20% – or $10,000 in commission. Bob Smith serves on a board for a medical device company. He knows they are struggling with a critical systems implementation and he asks the COO if she wants to talk with Patina about getting assistance. Patina wins the deal and it bills $100,000 – Bob earns 10% or $10,000 in commissions. He does not want the money due to his board role – so Patina donates the money to a charity of Bob’s choice. Here is a “Patina at a Glance” summary that you can download and share with anyone you wish.